Anyone who is in the market for a good lawn mower will likely have heard of the well known Husqvarna brand, which the company has manufactured for more than thirty years. Featuring a variety of different types of lawn mowers, Husqvarna covers the wide range of residential to commercial and maintenance needs. Their fine lawn mowers on the market today include traditional walk behind push lawn mowers, riding lawn mowers, yard tractors, and auto lawn mowers. The first thing that a prospective lawn mower buyer needs to determine is what is the best type of lawn mower for his individual uses and needs. A number of factors should be contemplated in making this choice. Among them are the condition, size, and slope of the person’s lawn, the location of the discharge deck of the lawn mower itself, and how often the individual wants to mow his lawn. 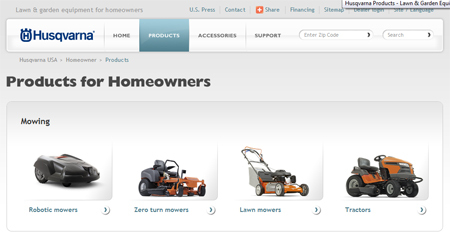 Husqvarna manufactures a range of choices in this first category of walk behind, or push, lawn mowers. There are self propelled styles, traditional push models, battery operated lawn mowers, and even electrical lawn mowers. The horsepower on such types of lawn mowers ranges from four and a half on up to five and a half HP. Costs start at $300 and go on up to $600. These are basic but effective types of lawn mowers, effective for most uses. For those who have already settled on having a riding lawn mower, Husqvarna has this base well covered. Perhaps the customer likes the appeal of these types of mowers’ maneuverability, cutting collection, has a larger lawn, wants view ahead capability, or fears the height of the grass. Among the variety of handy features on these types of lawn mowers from Husqvarna are front wheel steering, which permits sufficient amounts of braking and traction. Rear wheel steering can also be had. This provides better tracking for those uphill reverse maneuvers. On top of these standard steering choices, Husqvarna provides an option for articulated steering, which showcases a cutting desk that is bio clipping. This grinds up leaves it encounters into a good quality mulch. Horsepower for these riding lawn mowers runs from eighteen to twenty-six HP, while the lawn mowers themselves range in price from $2,600 to $3,800. Besides the standard walk behind and riding types of lawn mowers, Husqvarna also features several select lawn mowers that are fairly unique. First among these is the line of YTH yard tractors. These Husqvarnas are built for dealing with taller grass. Such models contain a variety of particularly helpful features, like a designed step through fender, hydrostatic transmission, mulching decks, bagging decks, discharging decks, and not to be forgotten, of course, a Briggs and Straton engine. Anyone who is either really busy, or just plain lazy, when it comes time to mow his lawn, will fall in love with the Husqvarna auto mower. Such lawn mowers only need the home owner to lay down a wire along the ground, which effectively marks the limits of the yard area which is to be mowed. Put the Auto Mower in the middle of the section and it will mow the marked off area on its own, without any oversight or further direction required from the individual. Amazingly, it manages to avoid exposed roots, trees, and more. This is all possible due to a revolutionary collision sensor that stops contacts with the majority of yard objects. It also allows the lawn mower to go into reverse, should it bump into an exposed or raised object. The cost of operating this incredible form of lawn mowers is reasonably low. It does depend on the specific area’s utility charges, the size of the lawn in question, etc. This Auto Mower costs about $25 in electricity charges. Some other advantages to utilizing it are its phenomenally silent running, along with its environmental sensitivity, since it does not emit carbons into the air. All Husqvarna lawn mowers come standard with completely free technical support from Northern Tool’s about fifty different outlets covering more than eleven states. Impressive warranties also come standard with any of the company’s fine lawn mowers. These start from two to three years for all labor and parts, and they can be extended beyond this amount of time. In addition, Husqvarna offers a number of helpful accessories from which to select. Among these are two behind sprayers, lawn aerators, lawn sweeps, manure spreaders, tail mowers, and trailer carts, which optimize the value and utility of the home owner’s purchase. But three years ago, in 2007, Popular Mechanics ranked Husqvarna as the best lawn mower of the year. It is not difficult to understand the reason why. Husqvarna offers the new Husqvarna Rider R155 AWD. This fine riding lawn mower is capable of handling wet grass, slopes, and other obstacles. It furthermore mulches the grass cuttings in order to offer the user a fantastic lawn fertilizer. For uneven types of lawns, this riding lawn mower could be the best mower available. Extremely maneuverable, the mower’s new AWD feature is automatic. With three cutting blades, the Rider R155 AWD also features a cutting deck which is front mounted. This allows for terrific access both under bushes, benches, and in corners. Its BioChip, when activated, turns the lawn clippings into mulch beneath the cutting deck before it releases them as effective fertilizer onto the lawn itself. This riding lawn mower does prove to be costly, at more than $9,000 for the base model, but it guarantees years of phenomenal service. Another Husqvarna special feature machine is the Husqvarna Zero Turn Lawn Mower, also known as the Z4217. This is a heavy duty, strong, stick controlled lawn mower which works for either semi-professional or skilled uses. The Z4217 contains the well known Briggs and Straton engine that features a potent seventeen and a half Horsepower. With more legroom than earlier models, it also showcases well implemented steering controls which allow for fantastic maneuvering and simple movement. A particular selling point of this model is its zero turning radius, perfect for tight yards. We bought a husqvarna riding lawn mower at lowes 4 yrs ago and the motor has already blowed up,junk!!! I’m wasn’t aware that Husqvarna made their own ‘junk’ engines. Are you sure it wasn’t a Briggs & Straton or a Kohler. And in that case, don’t you mean those engines are a piece of junk…and therefore every mower that uses those engines are a piece of junk? And since those are the only two brands of engines made for mowers, I guess half of all the mowers made are a piece of junk. That’s pretty scary! My Husqvarna riding mower blew a gigantic hole in right rear tire the first time I used it. Got to the other side of the house the first time when this happened. The Kohler engine blew up with 6 hours of use. Kohler put in a half block. Twenty hours later, it blew up again. Kohler put in a half block. Twenty five hours later, it blew up again. THREE TIMES! Sitting in storage at this time since May of 2014 after the 3rd blow up. Bought new from Lowe’s in 2012. In storage during winter times. Still getting the run around from Husqvarna, Kohler and Lowe’s. Any suggestions? After my last post, I was reading the other posts where I found a post of my own from 2013. This was after the 2nd blown up engine. The Kohler Courage engine blows because it’s made with plastic and metal parts. Who would think of using plastic where there is heat involved? Kohler trying to save a buck. I could have saved them more than a buck by not instituting this outrageous idea in the first place. Don’t buy Kohler Courage engines. Don’t accept a Courage engine if it’s offered free to you. I tried to sell this riding mower after it was fixed the 2nd time. Didn’t sell. It was late in the season where I think cutting grass was not at the forefront of a consumer’s mind. Took it home. Went to cut the grass with it and it blew up the 3rd time. I’d be having a lot more difficulties than having a 3x blown engine if that engine blew up the 3rd time with the new owner. The only thing Kohler will do is put in yet another short block, of course to only blow up again. They should be offering me a free upgraded riding mower!!! Three blown engines in 45 hours of use, no years of use. I bought a new 48 inch 26 horsepower husqvarna and after 87 hours work the trans was on way out. I was as carefull with the slopes by going across slopes.the real killer though was when I tried to trade for a john deere I was told it was one of the worst models on the market today. I felt foolish not to have researched more and that I trusted my country dealer. Now I have a kubota with 5 star review ratings all over the web . Bought a Husqvarna riding mower 2012 at Lowes and the belt will not stay on. I am calling it a lemon, but I have another name for it. DO NOT BUY A HUSQVARNA MOWER!!! I am so unsatisfied! Called the company, but can not talk with anyone, because they are experiencing a large call volume. GO FIGURE! After diligent research, I bought a Husqvarna 19hp/42 from Lowe’s, April 15, 2012 to be exact. The first time I used it, as I got around to the other side of the house on its first turn, I presume I ran over a rock although that rock couldn’t be found, the hole in the tire required 2 plugs which held for a while and then began the slow leak. Still under warranty, I paid to have it towed to a warranty service center to replace this tire (tires aren’t under warranty though are they?). I’m told at the service center that the tires were recalled. Good, I’ll kill 2 birds with 1 stone. Two and a half weeks later I get my tractor back. On its second outing after return, the Kohler engine “grenaded”. It was taken to another service center for repair on 10/1/2012. Kohler agreed to pay for the engine replacement, but not the labor. Excuse me? Evidently a Kohler rep had stopped by that service center who okayed labor charges for the numerous Husqvarna tractors that were sitting there as the owners could not afford to pay any labor charges, just like me. I got this tractor back on 12/7/12. Spun it around the front yard a few times and then put it away for the winter. On the 3rd grass cutting of the spring, 5/10/13, the engine became, maybe 30 seconds away from “grenading” again. Turned it off just in time, whatever difference that would make. I noticed just before the engine blew up the 2nd time, that the same tire with the 2 plugs was still on the machine which the 1st service center was to replace. I didn’t know about any recall until the person at the center told me about it. When I called about this plugged tire still on the tractor I was told that it was only the front 2 tires that were recalled. This was a rear tire, natch. Speaking of the warranty, which I do not have at this time, if this tractor’s tires were not under warranty, why did they happily tell me to tow it in to them to replace? The 2nd service center was for the blown-up engine. I have a friend whose living is made by fixing small engines and lawn mowers/tractors who took a look. He tells me the reason it blew up the 2nd time is because the working parts of the 1st blow-up were used to put in the new half block without thoroughly cleaning them therefore contaminating the new engine. Besides that, he also tells me, I should have had a full block replacement. This tractor always sounded so loud and rattling. Even the bulb for the headlight fell out. I’ve been using a 27-yo Craftsman that puts this Husqvarna to shame! but it was starting to nickle and dime me as it should at that age. Sure glad I kept it. Oh, I almost forgot. The first blow-up occurred at 20.4 hours. The 2nd was at 26 hours. Have had this Husky for not quite 13 months not using it for the winter and 3 months due to repairs. That’s a total of 8 months out of 13 months that it was not used. That’s 5 months of use with a total of 26 hours. How could I feel comfortable getting another one chalking it up to a lemon, because of the service centers’ workmanship. It was an easy tractor to drive for me as I’m on disability, but I’m sure there are others. Zero Turn 4217__ my husband died, cannot find manual!!! A 77 yr. old widow is not intelligent with mower terminology,let alone read a manual. Would you BE KIND ENOUGH to tell me the length blade I buy for this mower?? I have had Briggs and Kohler engines from sears and lowes in the past 30 yrs I have had no trouble with these mowers and I keep the maintenance on them myself I have a Husqvarna with a 20 horsepower Kohler engine now with over 300 hrs on it and it still runs like new so I must be one of the lucky ones. I rented the 24 HP tractor, with just 117 hours on the meter to do my lawn. Based on the reviews here, I’m fortunate the little SOB didn’t self-destruct. Has an idiotic way to get into reverse; you feel every bump you drive over. I loved my Cub Cadet 582; I bought it new in 1980. It was the ethanol in the fuel that ruined the fuel pump by eating through the diaphragm; then fuel mixed with oil in the crankcase which killed it. International Harvester always makes great equipment; Back when this machine was made there was no CORN LIQUOR in the fuel in 1980. The Husqvarna lawn Tractor has many flaws, I almost have to stand on the reverse pedal to get it to reverse and then of course the motor cuts out because my bum comes up of the seat ! The catcher is so heavy and awkward to fit back on anf there is no easy way to unclog the shute. This machine might be alright if you are a large,fit human but for a ordinary size female its very frustrating.